Vistas Vistas y Privacidad! Casa de tres pisos, sala de estar / comedor / cocina / rincón de cocina / dos habitaciones con dos baños completos en el piso principal. Decking fuera de la zona de la cocina. Arriba está el cuarto dormitorio con 1/2 baño y sala de estar. En la planta baja está el dormitorio principal con estufa sola propano soporte calefacción, terraza, baño completo con bañera con patas, ducha. Vista del océano pacífico, situado en 2 + acres / y ¿mencioné las vistas desde esta casa! REEMBOLSOS:: Las condiciones más allá de nuestro control, como cortes de energía, condiciones de la carretera, interrupción de la televisión, condiciones climáticas, corte de wi-fi, problemas con la bañera de hidromasaje, emergencias de huéspedes no constituyen una base para los reembolsos. We thoroughly enjoyed our visit to Ocean Crest. The driveway is a little scary, but once you get past that, the house is fabulous. Four bedrooms, each with a bathroom or powder room, all very private. A great dining table with lots of room and incredible views of the bay. It's a bit remote, so bring lots of food, although the market down the hill has a pretty good selection of last minute items . We had a great vacation with our friends. Home very spacious and the view is spectacular! Many wonderful side trips to Redwoods, delicious wild flour bakery and sightseeing. Thank you for your review, we appreciate it! 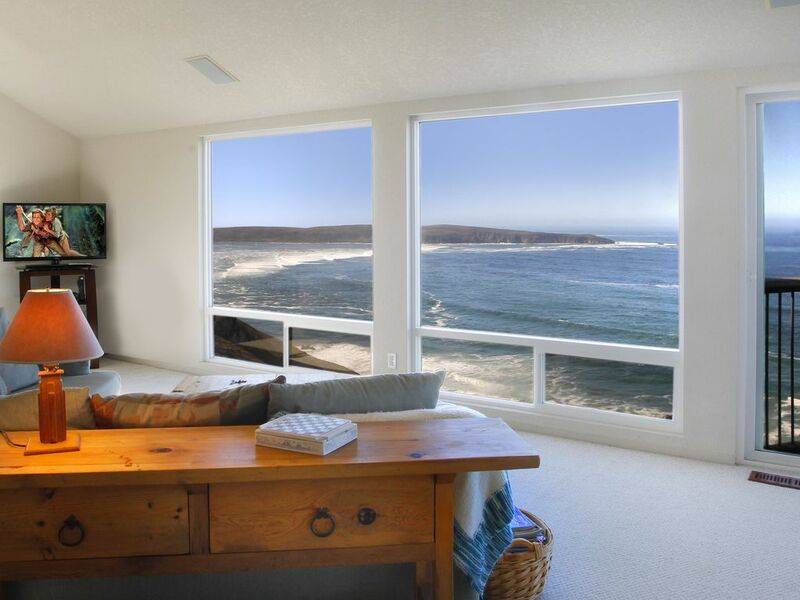 We are delighted you enjoyed your stay in the home, Dillon Beach and the surrounding areas. We hope you will visit with us again. Thank you again for your booking! Thank you for leaving a review for Ocean Crest we appreciate it. We are delighted you enjoyed the open space this home has to offer. Wonderful large house and unforgettable ocean views! We had a small family gathering and this house had more than enough room for everyone to gather or "do your own thing". Very stormy during our stay but the changing view made it even more memorable. We loved it!! I have stayed in Dillon Beach many times, and this house takes the cake for the views. Uninterrupted views of the ocean with no houses ahead. The house layout is also great and the three floors allow for some separation and privacy. We truly enjoyed our stay and this beautiful home. Just a few things that could have been better, but did not effect our good time. The wifi did not work at all. The lights went out during our stay (through no fault of the home), and there were barely any candles around. It would've been nice to have some candles or flashlights somewhere in the house for situations like these. There were no washer and dryer, which is not a big deal, but we were with children and it would have been nice to throw their ocean soaked clothes in afterwards. We had a blast. This house was magnificent and we would definitely stay there again. Thank you for your review we appreciate it. I sure wish you would of called us about the wi-fi and candles. The person that provides wi-fi lives full time at the beach and we could of sent him right over to take care of the problem. AND had you called us about the lack of candles we would of brought you lanterns. We have placed lanterns in the home in the event this happens again. Thank you again for your booking and your review! We had a wonderful stay, the house is in a great location with amazing views, it is well maintained and the kitchen is very well stocked. Thank you for your review, we appreciate your taking the time to write it,. We are delighted to find out that you enjoyed your stay and we hope you will consider booking with us again. Refunds: Conditions beyond our control such as; road conditions, power outage, weather / storms, TV outage, hot tub issues or guest emergencies do not constitute a basis for refunds. Reservation will not be confirmed until renter has signed the reservation contract. The reservation contract will be sent through Docusign, on line electronic signatures.